Zumper Reviews - Best Way to Rent an Apartment? 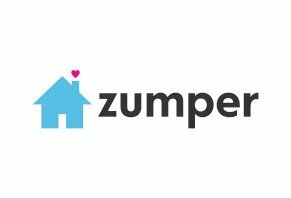 Zumper is an apartment, condo, and home rental listings website that offers several unique features to make the process easier for tenants, agents, and landlords. Zumper offers a real-time, searchable inventory of more than one million rental home, condo, and apartment listings across the US and Canada each month. In fact, their listings are so current they promise you’ll find new inventory before other competitors like Craigslist, Zillow, or Trulia. Their ‘Instant Apply’ feature also gives members the ability to maintain a current Experian credit report and application on file, and then quickly send it over to listings they’re interested in. This could potentially help them “jump to the front of the line for competitive apartments and avoid crowded open houses”—while saving a few trees in the process. 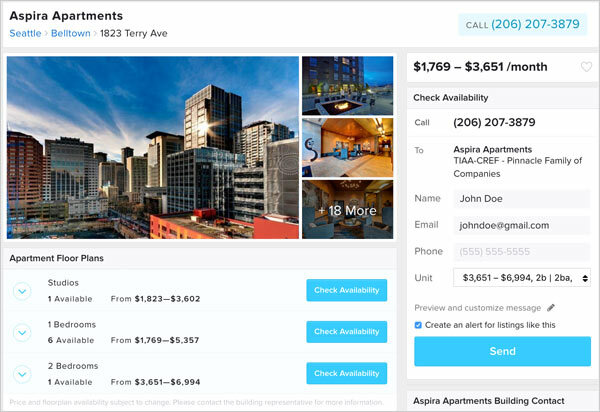 Together, Zumper believes that renting an apartment should be as easy as booking a hotel. And if you need assistance along the way, they have a team of rental experts standing by. But the big question is: Can they really help you find a perfect apartment? Even if they can, should you put all of your eggs in one basket, or also focus on some of the competition? Let’s start helping you find some answers by looking at Zumper’s functionality. Unit Amenities – Air conditioning, assigned parking, balcony/deck/yard, furnished, in-unit laundry, etc. Building Amenities – Business center, concierge, elevator, fitness center, swimming pool, on-site laundry, etc. After entering a city, Zumper will display matching results, which can be modified based on criteria like price, number of beds and baths, and whether or not pets are allowed. Credit: Zumper, Inc.
You can also save your searches and set up real-time alerts, which will allow you to receive notifications any time a new rental becomes available that matches your criteria. Once you find a rental that you like, you can click on the listing to learn more. This will include additional pictures, floor plans, rent ranges for different models, detailed description(s), and unit and building amenities, along with average rent, trends, and walk score for the area. Each floor plan for a property will feature a ‘Check Availability’ button next to it, which allows you to send a message directly to the management. Credit: Zumper, Inc. Compared to many other rental websites (more soon), Zumper gives members the ability to securely create and save an Experian credit report (this “soft pull” will not affect your credit score), along with a rental application, in less than five minutes. All you have to do is create an account by entering your name and password, or by linking your Facebook account. Then, you’ll complete an Experian credit report by entering your date of birth, Social Security Number, and your current address, and choosing security questions. From there, Experian will run a credit report, display the results, and store them for later use. Zumper’s online rental application involves much of the same initial process (without the credit check, of course), but you’ll also need to list your previous residences, current occupation, financial details, and references. When you’re ready, any properties displaying an ‘Instant Apply’ icon (currently only available for listings with purple badges in the Atlanta, Chicago, Dallas, Denver, and Houston markets) will allow you to use Zumper’s unique feature, which will also guarantee that management will review your application once it’s sent. 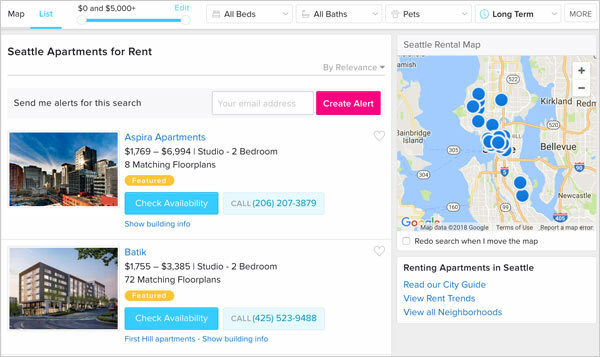 Outside of their listings, Zumper also provides easy access to a wide variety of generic and city-specific rent reports, as well as rental guides. What’s the Difference Between Regular Zumper & Zumper Pro? While Zumper’s main service is consumer-facing, their Pro program promises to help make it easy for agents and landlords to post rentals—not just to their site, but also through syndication to other top sites like PadMapper and Realtor.com. They can also screen tenants (US-based customers only), including nationwide eviction and criminal checks. Pro members can set their own application fee, which is paid by applicants directly online with their credit card. How Much Does Zumper Cost? Zumper’s Standard version is free. According to their FAQ, Zumper Pro accounts are also free if you have a PadLister account (again, free), and are posting a listing outside of New York City. If you have additional questions, support can be reached via the contact form on their website. What Can We Learn From Zumper User Reviews? On Yelp, we encountered 11 Zumper user reviews at the time of our research, who had given the site an average rating of about 1.5 stars. Common complaints referenced less-than-stellar functionality (especially on the landlord side) and customer support. Between more than 11,000 combined reviews on Google Play and iTunes, the Zumper app had a much higher average rating of about fours stars, with most compliments revolving around ease of use and quality listings, while the relatively few complaints related to bugginess. Zumper held a B+ rating with the Better Business Bureau as of 3/14/18, with no closed complaints. Are There Other Home & Apartment Rental Sites Like Zumper? There are perhaps hundreds of national, regional, and even city-specific (especially for competitive markets like San Francisco and NYC) rental websites available to choose from. In fact, Zumper mentions some of the biggest competitors directly on their website, including Craigslist, Zillow, and Trulia, along with other options like HotPads, Rent.com, Apartments.com, and Realtor.com (to name just a handful)—most of which are also free to use. From a landlord perspective, there are also many other sites (some of which are free) that assist with tenant screening services, such as Cozy, MySmartMove, and MyRental.com. However, we didn’t encounter any other options that combined a free rental search service, tenant screening for landlords, and credit report and application services all under the same roof, at the time of our research. So, if you’re looking for something exactly like it, Zumper is currently the only game in town. Does this necessarily mean you should use them, though? We found Zumper’s website super easy to use, with quality, in-depth listings that provided high-resolution images, detailed descriptions, and all of the important information renters would need to take the next step. On top of this, both their standard and Pro versions are completely free, so you might not have much more to lose than a few minutes of your time if you give them a try and find they don’t meet your needs or preferences. They are not prompt with scheduling viewings, very opaque and in the way they operate. They will frustrate and delay you and try to run the clock down on you so you are desperate. Once that happens, they will force into one of the buildings they have a deal with and make a commission. Avoid. I am a realtor in Jacksonville holding a license for 30 years. Never in my life if I had such a horrible experience with a company that is intended to help the customer. My customer was trying to get an apartment and lost out on it because the emperor keeps saying they can’t verify her. We call for help they will not answer the phone and over 29 emails have been sent to no avail. Several voice messages no phone calls back…It’s tough to get an apartment here and she lost it it was a rare find. We are still waiting for help. Together with my family, we were looking for a place in Chicago. Early on we engaged LaDarian at Zumper to help us as a real estate agent. I have moved about 10 times over the course of the last 10 years and LaDarian has easily been the best real estate agent that I have ever worked with! Hands down. He does what he says, he is super professional, and as a Chicago native, he really knows his city. If you are looking to move to Chicago or within Chicago, make sure to reach out to LaDarian at Zumper! We had a fantastic experience working with Amanda from Zumper (Denver). She was wonderful from start to finish. She took the time to listen to what we wanted and had great communication with us throughout the entire process! We would highly recommend using Zumper! I’m a real estate broker and I sent my clients to Zumper for applications and credit reports. Ours is a very competitive market and when the property comes up a person interested need to move quickly or they will lose the property. That’s one of the reasons that I used the site. My clients went to the site, paid their money, filled out the application and had their credit run. Then we were unable to access the information from their site. The support was virtually nonexistent. No phone support, only email which was pretty much automated and not helpful which came about 10 hours after my first request for help. About five or six hours after that an email comes back telling me that they can reset everything, but all the data, applications and credit reports will be deleted. I asked them how they can be restored and I get no response. Write a Review for Zumper!